Lavender – How Does it Work? I’ve been using lots of lavender oil recently because it’s good for relaxation. 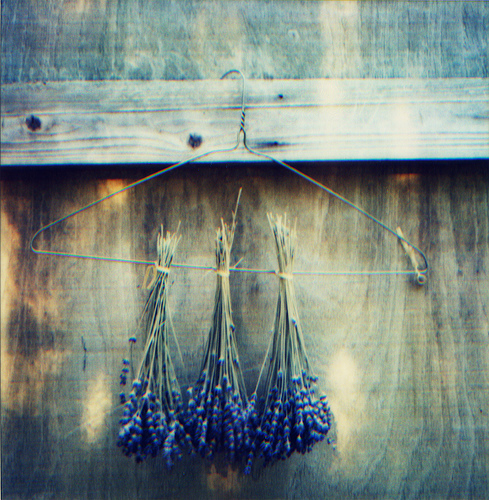 But it got me thinking…we all know lavender is calming, but how does it work? The molecules of lavender essential oil are light and very small – one drop of lavender essential oil contains 40,000,000,000,000,000,000 (40 million-trillion) molecules. When applied to the skin, the tiny molecules in the lavender oil are easily absorbed into the skin and then filtered into the blood stream. When inhaled, the smell receptors in your nose catch the essential oil molecules. These receptors send impulses along nerve fibres which end in the centre of the brain. To stop harmful substances reaching the brain, we have a blood-brain barrier. This barrier is a fine membrane (a bit like a sieve) that separates the central nervous system from the blood stream. This barrier only allows very small molecules through. Lavender oil contains molecules small enough to penetrate this barrier. Studies with brain wave frequency have shown that the scent of lavender increases alpha waves in the back of the head – alpha waves are a type of brain activity that occurs when someone is in a quiet resting state. Lavender oil is a sesquiterpene. Sesquiterpene molecules carry oxygen molecules to cells. People are frequently told to take deep breaths for relieving nerves and anxiety. This is fascinating – I had no idea Lavender was this powerful!! Lavender also helps soothe hyper, nervous pets! We in it, along with chamomile, & balsam in our Placid Pet Bandanas ~ great for storm fears, travel nervousness, separation anxiety, recue pet issues, etc.